When was the last time you went without eating for an extended period of time? Was it self-induced or was it because you had no other choice? Many will choose not to eat for various reasons. But wanting to eat, and not having the food to eat when you’re hungry, is a bad place to be in. This goes without saying when the hungry include your loved ones. That’s why it is important for new and experienced preppers to put in place a food storage plan. 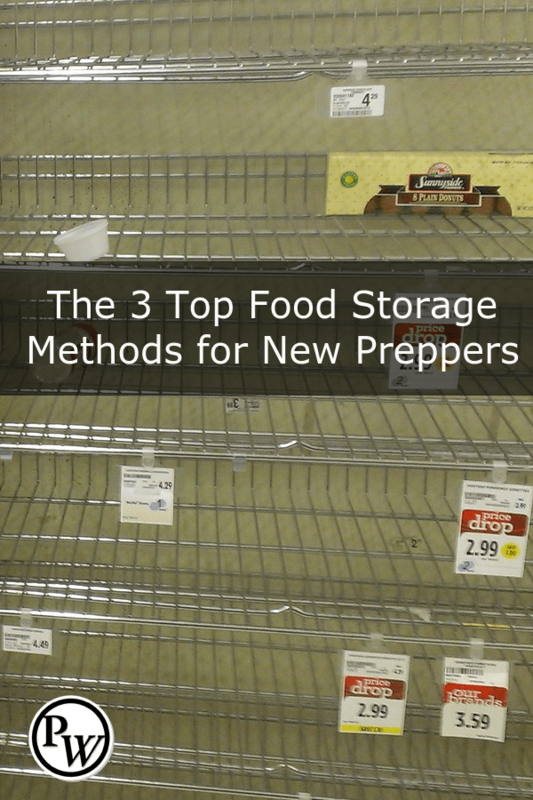 This article will discuss the top 3 food storage methods for preppers. 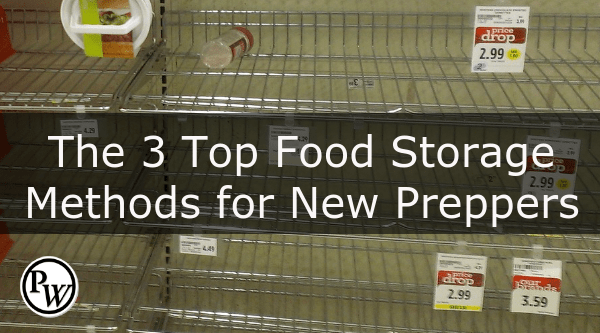 The first food storage method that I would recommend to a new prepper is building your pantry through canned and dried food that you purchase at the grocery store. In my opinion, this is the most affordable and the easiest to do. Canned food lasts a long time. In some cases, they have found canned food that is at least 100 years old. The canned food was still microbiologically safe! Now, I’m not recommending you start seeking out 100-year-old canned food, but it is good to know that if you have canned food and you store it in a climate controlled pantry, it will last longer than you might think. The way to be effective here is to create a menu for your family using canned and dried food. You need to create a week’s worth of breakfast, lunch, and dinners. The best strategy to employ here is to actually put down things your family would eat. Experiment if you have to! Once you get a menu with a week’s worth of food, then double it. Then double it again. Congratulations! You now have 1 month of food storage! Remember, you can use dry goods too. So, a menu item with some rice and beans that you need to cook are good. And although it isn’t the healthiest of food (send nasty emails to todd dot sepulveda at idontcare dot com 😉 ), you could pad your breakfast with something like Pop-Tarts. But first, start with that first week, then you can easily add to it! For more information on this method, read – Your EASY Food Storage Solution. The second food storage method that I would recommend to a new prepper is building your long term food storage with mylar bags, oxygen absorbers, and 5-gallon plastic buckets. Yes, I’m talking about DIY your very own food buckets. This is one of the most affordable ways to build a long-term food pantry. Rice and beans are what most people think about when you start talking about DIY food buckets. And rightly so, they are affordable and store really well. But you can also store other things like pasta, oats, sugar and of course, wheat! The key here is to actually use the items you are storing. You don’t want to store a bunch of wheat and then learn how to “use” it when the SHTF! You want to use the items you store now! Or better yet, make sure your family will really eat it before you start storing a bunch of buckets! If you want a lot more information on making your own food storage buckets, check out my article, The UBER Guide to DIY Food Storage with Mylar Bags, O2 Absorbers, and Buckets! You will find a ton of resources there! And, you can also check out the video below where I walk you through how to make food buckets. The third food storage method I recommend is to purchase some dehydrated long term food storage. Dehydrated food storage is usually sold in prepackaged individual or family meals. They also come in some sort of bucket or tote, which makes it really easy to store and also to pick up and take with you if you are having to leave your house in a hurry! A word of warning is needed here! Not every dehydrated food storage is made the same. Nor do they all taste good. I recommend purchasing a small sample package to test out before you make the investment of purchasing a bigger amount. You should do your homework, but the company I recommend is Legacy Foods. Legacy Food tastes good and it is a better deal per pound of food than the other food companies out there. You might be interested in this price comparison chart – CLICK HERE. Just like all food storage, dehydrated food needs to be stored in a temperature controlled environment. You can’t keep this food in your garage or shed. However, if you can store it in a closet or pantry, it will last you a long time! Many new preppers who feel they don’t have the time to build a food pantry or don’t want to deal with the hassle of making food buckets will purchase dehydrated food. And like I said, these buckets are easy to grab and go in a hurry. If you are looking for a good deal on dehydrated food, Legacy is having one of their best sales in the companies history. Right now, their 64 lb – 240 serving package is $399. That is 39% off the regular price. And you can save over $960 on their 277 lb – 1080 serving package. And, there is 20% off everything else on their website till Memorial Day when you use the coupon code – MEMORIAL20 at checkout. Food storage plays a very big role in preparedness. If you are preparing for yourself and your loved ones, you want to make sure you have food in place during a local crisis or if the SHTF. 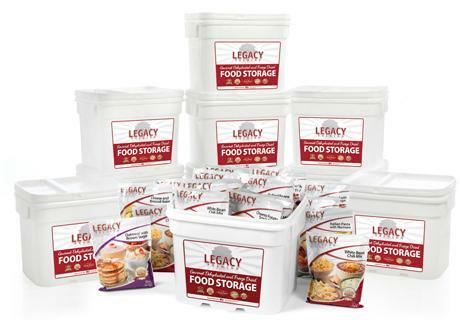 The time to get your food storage in place is now. These three methods are proven to get you where you need to be. You just need to buckle down and do it! In a crisis, your loved ones will be glad you did! For more information on Food Storage, search the Prepper Website Tag Cloud!